Each summer Kirstenbosch Botanical Gardens (located on the slopes of Table Mountain) host a series of "Summer Sunset Concerts". We joined a couple of friends for a picnic on the lawn while waiting for Shaun Morgan - lead singer of Seether - to make his appearance. Seether, originally a South African heavy-metal band, moved to the United States a few years ago to take the next step in their musical career. Since then they have toured the world gathering thousands of fans along the way. This evening Seether returned to their place of birth for an open-air acoustic concert. 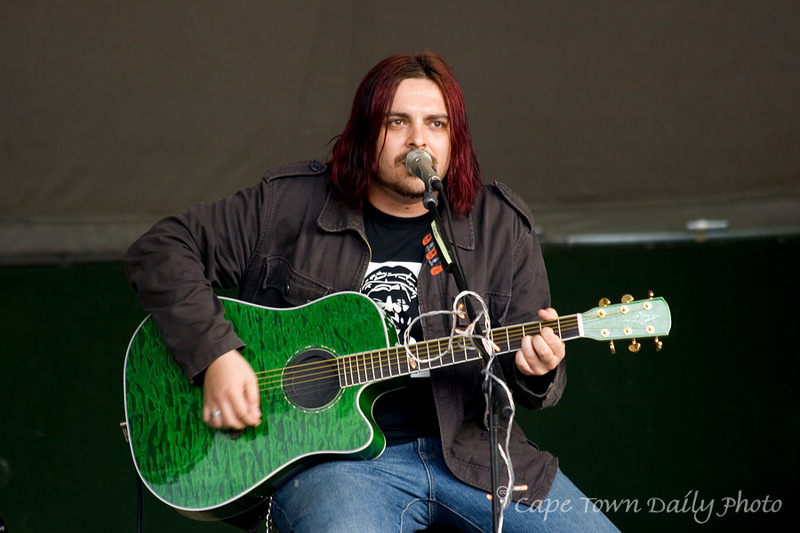 Shaun Morgan's performance was exceptional - his voice is well suited to acoustic renditions of their heavy-metal tracks. The rain that started halfway through the concert only added to the vibe and atmosphere. We were soaked and cold, but absolutely loving it. I found one of their music videos on YouTube, so if you like guitars with raspy distortion click here and take a look. Posted in General on Sunday, 6 January, 2008 by Paul.